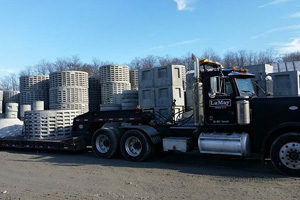 SERVICES – LaMay & Sons, Inc.
LaMay and Sons, Inc. is the professional full service excavating company you can depend on. We have knowledgeable staff ready to work with you from beginning to end on your excavation needs. You will enter into a single contract with LaMay & Sons for the construction of your project. Our integrated team will gather resources needed to make your project a success, coordinating with all necessary municipalities, engineers, etc. We are a leader in this area of delivery so let us know you the benefits. Complete Site Design & Development, Commercial Site Work, Residential Site Work, Grading Services, Building Pads, Roads, Parking Lots, Driveways, Land Clearing, Demolition, Septic Systems, Rough Grading, Finish Grading, Erosion Control, Storm Water & Sanitary Sewer Installation; as well as Hauling Dirt, Gravel and Rock. 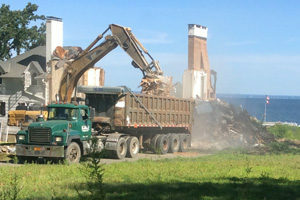 Since 1912 LaMay and Sons, Inc. has been providing customers with a fast, safe, and accurate demolition. We have successfully demolished hundreds of residential and commercial dwellings. 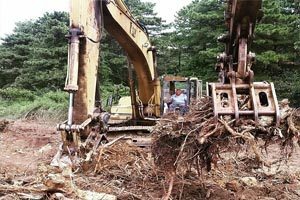 We will handle everything, from the demolition permits, utility disconnections and the complete clean-up and grading of the lot. We have the right equipment to demolish any structure safely and will ensure the residential demolition job is completed in a professional and efficient manner. Homes, Sheds, Barns, Garages, Swimming Pools, Commercial Buildings and many more. Our team offers expert storm water and sanitary sewer installation services. 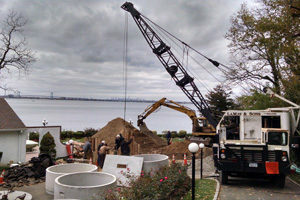 We understand the complexities of sewer installation and will be sure to install the best system for your project. 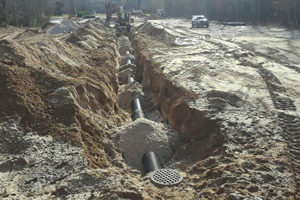 We handle all aspects of sewer installation which include excavation for the sewage system, the sewer installation, and repairs and maintenance afterward, if necessary. Install storm water collection systems for existing/new buildings, homes, parking lots, and roadways. Specialty rings used for the installation of drainage or sanitary work that cannot be installed using conventional methods. At LaMay, we understand that deep excavation is somewhat of a “delicate” matter, and careful monitoring is required to ensure that the integrity of nearby structures is not adversely affected, and the stability of the project is sound. We focus intensely on providing a safe work environment in all types of ground conditions so that your installation or construction project can be safely completed. 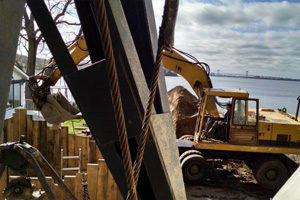 Sheathing/Shoring for excavation is required in any situation where a site is to be excavated to any significant depth. 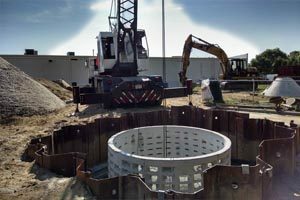 The elements necessary in any shoring system depend largely on the specific project requirements, ground conditions size and depth of the excavation site, and more. Permanent, temporary, driven or drilled in. Wood lagging and/or steel sheathing. It is occasionally necessary to “draw-down” groundwater to complete an underground construction task effectively during the installations of foundations. 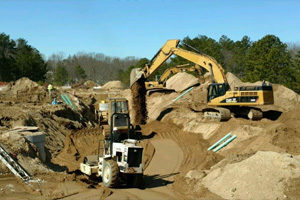 We offer a “one-stop ground water control shop” with our highly trained team and wide range of equipment and services. Our grading services begin with highly trained and experienced operators who go through a series of preparations that include but are not limited to cutting, filling, compacting, leveling the ground and backfilling where needed in order to make sure the site is designed for correct drainage. We understand the importance of grading your site accurately and in a timely fashion. 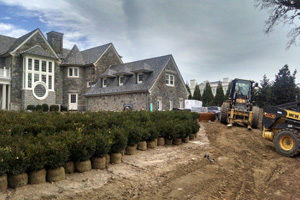 We provide both residential site work and commercial grading services. 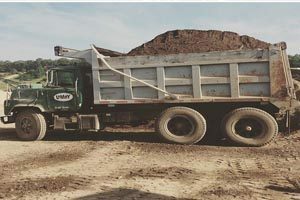 Our Grading Services Include: Site Preparation, Land Clearing, Land Leveling, Building Pad Foundations, Landscape Preparation, Road Work, Back fill Services, Grading Driveway, Sidewalk Grading, Job Site Clearing and Grading. Haul asphalt, debris, rocks, soils, etc. Excavator and/or crane excavations that extend into suitable drainage soil typically required for new construction. Clear and grub sites for new improvements. 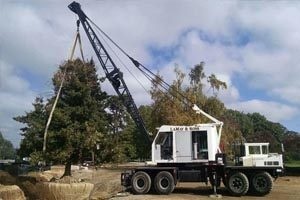 Whether you need heavy crane work for your industrial or commercial job or you are looking for a knowledgeable crew to tackle the crane services at your new construction site LaMay Construction is here to help. Primary used to collect rainwater for residential, commercial and institutional. Our dedicated team is available to help you during business houses. © 2018 LaMay & Sons, Inc.